Who’s making so much noise in the bathroom? Splashing, sloshing, bubbles, soap, toys, everywhere! Look out! Mother is coming! Who’s taking a bath? Jeremy Bear just wants to take a bath – by himself – but little brother Benny has other ideas. How will Jeremy get himself out of this messy situation? Check out the reviews below! This is a cute story about two brother bears taking a bath. In her debut book, Alice Berger and illustrator Carolyn Ann Aish (Studio Seven Publishers), have managed to create a fun and playful story of two teddy bears and their bath time. Jeremy Bear was taking a bath when his brother Benny, who had gotten very dirty wanted in. But Jeremy is a big bear now and wants to take his bath by himself. When Benny gets in he proceeds to do what all kids like to do when they take a bath…make a big mess. There’s splashing, sloshing, toys, and bubbles everywhere! And to top it off Mama Bear is coming to see what is causing all the commotion in the bathroom. Your kids will enjoy this tale about bath time. It’s a short read at only 16 pages long, and it is a soft book with the cover printed on very glossy paper. The book is ribbon bound with purple ribbon. The illustrations aren’t drawings but are pictures of two white teddy bears taking a bath. It’s unique and fun and your youngsters are sure to love it. The story is pitch perfect and is too wonderful to miss. Hopefully we’ll be hearing more from Berger, because she is a wonderful storyteller. Who’s Taking a Bath? is a soft-cover, 8×10 picture book about a lovable character named Jeremy Bear who’s minding his own business while taking a bath when his little brother, Benjamin (Benny) Bear, begins banging on the door, wanting to join him. When Jeremy refuses, Benny finds he can get into the tub through an open window in the bathroom. Benny makes a huge mess, and Jeremy has to find a way to not get blamed when their mother finds out. “Now look what you did,” Jeremy cried. “Mom is going to get mad at me for making a mess!” This is a perfect book for an older brother or sister who is maturing and has learned to keep themselves clean, yet is often pestered by a younger sibling. It also can be used as an incentive to get children to take a bath! 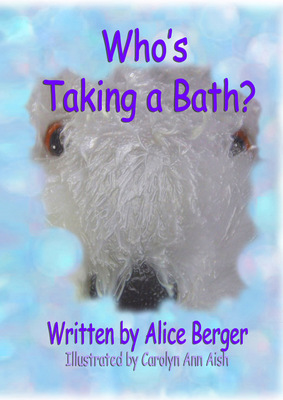 Written in 2007 by first-time author Alice Berger and illustrated by Carolyn Ann Aish, Who’s Taking a Bath? uses a mixture of illustrations and photographs, as well as a soft-ribbon binding, to create a special picture book young children would enjoy reading again and again. ~ Maria Corkern is the author of Doris Thesaurus. This shiny-covered soft-cover book, bound with a braided purple ribbon, is your first indication that this is an out-of-the-ordinary picture book! The vibrant text by author Alice Berger makes every word count and she spins a fun story. The photographs of two white teddy bears, brothers Benny and Jeremy, makes this a very attractive book for this age group. Benny has been playing and gets dirty, so he knows he needs to take a bath before Momma Bear sees him. The problem is that older brother Jeremy is hogging up the bathroom and has locked him out! Jeremy is sick and tired of sharing his bath with his younger brother, and just wants to enjoy his bath all by himself. Jeremy tells him to go away when Benny pounds on the bathroom door. When he hears Benny walk away, Jeremy relaxes a bit, dunks under the sudsy water, and comes up squeaky clean. He looks up at the now-darkened window, and there’s Benny, ready to take a flying leap into the tub! He does, and a verbal battle ensues. Tired of not only sharing his bath with his brother, but also getting blamed for the misadventures of Benny, Jeremy steps out of the tub, and dries himself. While Benny is underwater, Jeremy hurries up and opens the bathroom door so Momma Bear can hear Benny creating a sudsy mess in the bathroom. You’ll just have to read this cute book to see if Jeremy escapes before Momma Bear’s arrival, or if he has to share in the blame of messing up the bathroom. This very visual book with its crisply written text, shiny front and back cover pages, and huge colorful photos of suds, teddy bears, and an occasional rubber ducky, is sure to be a great delight to all your little ones. Older brother Jeremy Bear wants his solo time in the tub, but little brother Benjamin breaks into the bath and makes an enormous mess. Jeremy is certain Momma Bear will blame him as usual…until he concocts a brilliant plan that will leave poor Benny squeezed out and hung to dry! Alice Berger’s debut picture book, Who’s Taking a Bath?, is a humorous story of sibling rivalry with adorable illustrations. The book is a fun read, and it’s sure to give older brothers and sisters a good laugh. ~ Donna Boock lives in Pennsylvania with her husband, daughter, and adopted dog. A stay-at-home mother, she writes in the blessed hours when her not nearly sleepy enough daughter naps. Please look for her soon-to-be-published story Making a Mother’s Day in the online magazine Stories for Children in May 2008, and for her mystery Night Owl Nabs the Sheep Snatcher in a future edition of Highlights for Children magazine. Bear lovers beware- these troublesome Teddies can cause some serious mischief! Who’s Taking a Bath? is an entertaining story which captures the antics of two spunky bear brothers as they make a major mess in the bathroom. Jeremy is frustrated when his pesky little brother won’t let him bathe in peace, but he has the last laugh when Benny is hung out to dry. It’s a fun spin on sibling rivalry to which children will easily relate. Teddy bear buffs will delight in the endearing photographs throughout the picture book. ~ Maureen Straka is a teacher, reading specialist, and a mother of two young boys. She has stories accepted for publication by Spider, Clubhouse Jr., and Stories for Children Magazine.